Oxix® Dissolved Oxygen measurement Transmitter is developed to measure dissolved oxygen in water and wastewater processes. The optical sensor has no consumable parts like membranes or chemicals, and the optical sensor is almost maintenance free. When the sensor’s built in tubing connection is connected to a valved air or water line, a regular flushing of the optics can be controlled by the converter. The Oxix® dissolved oxygen transmitter is a unique system that combines advanced electronics with a solid-state optical sensor. No other dissolved oxygen system can compare with the features and benefits of this revolutionary design. The Oxix® sensor utilizes an optical technique that does not consume oxygen like all standard membrane sensors. The sensor has a light source (LED) transmitting light at a specific wave length to the backside of the optical window covered with a special gel. A fluorescing process occurs depending on the amount of dissolved oxygen in the liquid and the sensor determinate the oxygen level as a function of the fluorescing process. The Oxix® converter is similar to the MJK SuSix converter with a logical menu structure with mobile phone type navigation. There are also a number of selectable languages in the large graphical display. The Oxix® Display indicates the measurement in engineering units and has a built-in data logger with a memory of 160.000 data points with time/date stamp. The logged measurements can easily be transferred as a CSV file to a PC using the buil-in USB port. This allows easy spreadsheet data analysis. The Oxix® Converter has a 4-20mA output, two relays for control or alarms, and a digital input for automatic range changes and more calibration curves. Alarms are also indicated as pop-up menus and stored in the Oxix® converter’s alarm log. The Oxix® display is configured by the operator so only the relevant data are indicated with an option to name the display with a site tag name or number. 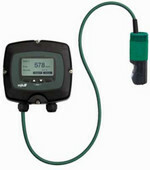 The converter has a time function to control the cleaning system for the sensor for almost maintenance free operation. MJK’s Oxix® Converter can work in networks with other Oxix® units, other MJK products, or with third party SCADA and telemetry systems via is RS485 Modbus communications. The MJK Oxix® display can supervise, set-up and operate up to four Oxix®or other MJK devices for enhanced economies of space and lower cost. Measuring dissolved oxygen near the water surface at a constant depth even as the surface level changes, is required at many water treatment installations. The MJK Oxix® Ball Float rises and falls with the water level keeping the MJK Oxix® Transmitter right where it needs to be. The flexible design includes a hinge bracket for a PVC pipe that clamps to a railing. This system also allows easy change outs of mechanical components and sensors. PVC pipes can be supplied locally and cut to length. The Oxix® Ball Float installation simply uses a 45 degree elbow and adaptor fittings (see back) for complete flexibility. Oxix® Ball Float components can be delivered separately to retrofit existing pipes, fittings, etc. on older or worn-out DO systems. This reduces the cost of retro fitting with MJK Oxix D.O. monitoring systems. It is often an advantage to measure DO close to the surface. We have developed a mounting kit with a float which holds the Oxix® sensor at the optimal measurement depth other manufactures DO float fittings so the Oxix® float and Oxix® sensor can be mounted on other manufacturer’s existing bracket and pipes. Click the button below to add the OXIX® DISSOLVED OXYGEN TRANSMITTER to your wish list.